Wouldn't you love to wake up to a pan of these? 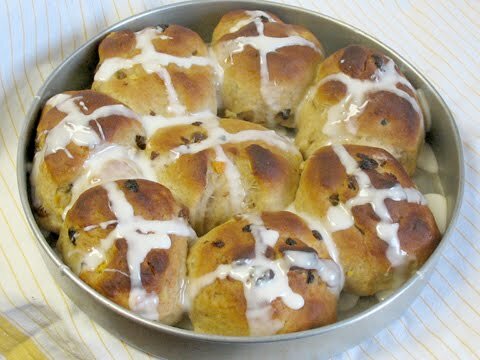 Warm soft hot cross buns, dotted inside with rum-soaked currants, fragrant with lemon zest and yeast, with a sweet cross of icing on top. Heavenly! This is the third recipe that I made for my friends on our Baking Day, so it started with thawed frozen bread dough, too. I kneaded in the lemon zest which turned out to be harder than I thought it would. Freshly grated lemon zest has lemon oil and the lemon oil kept the dough sort of in layers as I kneaded it. Again it just takes patience and persistence and remembering to let the dough sit for five minutes if it becomes too hard to handle. Once the zest is kneaded in the dough is more willing to have you knead in the rum-soaked (but drained) currants. After that it's just a matter of dividing the dough and shaping the pieces into buns. Once the buns have proofed in the buttered pan they bake up as pretty as any dough you would have made yourself from scratch. By the way, any of these recipes can be made with a dough you make yourself from scratch. Although the frozen bread dough is pretty plain, you could make a dough that is sweeter, richer from extra butter, milk, and/or eggs, or made with other flours than white. I'm not sure how to do a gluten free yeasted bread successfully, but I'm sure someone has figured it out, so that's a possibility, too. The thing that ties these three breads together is the 'spring' theme and the idea of shaping the dough in nice ways. The frozen bread dough makes it easy, too, if you are not too sure of your skills in making yeast doughs, plus it speeds up the dough to table process a bit. I would love to know if you tried any of these recipes and how it worked for you. I'm going to go back to making dough from scratch, but it's nice to know that I can turn out a stunning bread in quick time if I have frozen bread dough on hand. Thaw frozen bread dough, flatten on a lightly floured board. Sprinkle on finely shredded zest of one medium orange or one large lemon, plus 2 tablespoons granulated sugar. Roll up and knead. Flatten again and sprinkle on 1/4 cup currants which have been soaked in 1/4 cup rum. (Discard rum and drain currants before adding to dough). Roll up dough and knead fruit in. Divide dough into pieces of equal weight. With floured hands, shape into 8 smooth rounds. Evenly space rounds in a buttered 8- or 9-in. square or round pan. Cover loosely and let rise in a warm place until doubled and puffy, about 40 minutes. Meanwhile, preheat oven to 400°. Brush buns with beaten egg. Bake until deep golden, 13 to 15 minutes. Let cool in pan at least 30 minutes. In a small bowl, stir together until smooth 1 teaspoon lemon and enough powdered sugar to make a pipe able icing. 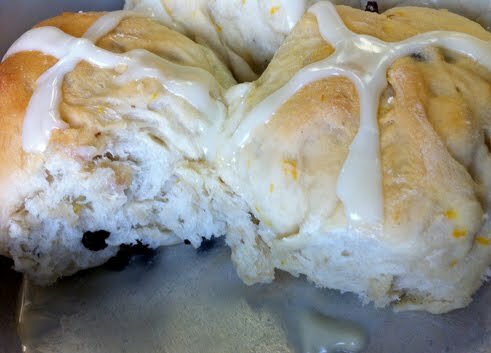 Spoon into a small, heavy-gauge plastic bag, snip a hole in a corner, and squeeze icing onto cooled buns to form large Xs.